Mergers are the past, present and future of the US utility industry. Since the days of Bell and Edison, heat, water, electricity and communication companies have found that they can lower costs and improve operational efficiency by adding scale. And in a sector where businesses still operate largely as monopolies or oligopolies, consolidation is the easiest way to drive growth. Over the past century, thousands of mergers have occurred between regulated utilities, none of which has failed to create a stronger entity with staying power. No other industry boasts this track record. And customers have benefited from lower costs and greater reliability, while shareholders enjoy improved profitability. Ironically, tie-ups between utilities often engender a great deal of controversy and complication. Larger deals, for example, may require winning approvals from half a dozen or more regulatory bodies. Even the least contested deals usually take at least a year to final consummate. And in some cases, the process has lasted as long as two years. Most utility mergers eventually gain approval, provided the involved parties parties are determined enough to see them through and willing to make the requisite concessions. But commitment is no guarantee of success. And because politicians appoint most regulators, even deals that appear to be a shoo-in for approval can encounter major roadblocks. Investors should expect consolidation in the utility sector to continue; the economic incentives to grow through mergers and acquisitions are just as compelling as a century ago. Not only are larger utilities better-equipped to handle fluctuations in energy prices and other headwinds beyond their control, but scale also makes it easier for essential-services firms to fund capital expenditures. Ongoing investment is the key to earnings growth for utilities, making regulatory support for the expenditures a critical component of system reliability and long-term profitability. Like Exelon Corp’s (NYSE: EXC) all-cash offer for Pepco Holdings (NYSE: POM), Wisconsin Energy Corp’s (NYSE: WEC) $8.93 billion acquisition of Integrys Energy Group (NYSE: TEG) is all about adding scale in regulated business lines. Meanwhile, the proposed tie-up between Wisconsin Energy and Integrys Energy goes one better, increasing regulated revenue to 99 percent of the top line–once the target divests its energy services segment. The combined company will operate assets in four states–Illinois, Michigan, Minnesota and Wisconsin–and deliver electricity to 1.5 million customers and natural gas to 2.8 million. This scale will make the firm the nation’s largest regulated gas utility. To serve this massive customer base, the post-merger Wisconsin Energy will have 71,000 miles of electricity transmission lines and 44,000 miles of gas distribution pipelines. The combined company will also own a 60.3 percent interest in American Transmission Co., which dominates high-voltage transmission in the upper Midwest. After the deal closes, the utility plans to spend $700 million annually to add new transmission, distribution and generation assets. With regulatory support, these investments will expand the two firms’ combined rate base of $16.8 billion. Management expects this acquisition to fuel annual earnings growth of 5 percent to 7 percent and dividend increases of 7 percent to 8 percent. An anticipated payout ratio of 65 percent to 70 percent bodes well for sustainability. In a conference call to discuss the merger, Gale Kappa, CEO of Wisconsin Energy, stated that the deal was “not based on specific synergies.” Instead of boosting profitability via cost cutting, the two parties expect to drive earnings growth through system investment. This outlook is one reason why Standard & Poor’s, Moody’s Investors Service and Fitch Ratings view the deal as negative for Wisconsin Energy’s credit rating. The company also plans to take on $1.5 billion in debt to fund the cash portion of the acquisition. Based on the ratings agencies’ response to previous mergers in the utility sector, expect them to hold Wisconsin Energy’s current marks when the deal is done. But even if the deal leads to a downgraded credit rating, Wisconsin Energy should have no problem raising low-cost capital and realizing considerable savings by refinancing some of Integrys Energy’s existing debt. Consider Wisconsin Energy’s 6.875 percent bonds that mature Dec. 1, 2095. At their current quote, these bonds yield 5.27 percent; investors are willing to lock up money with the company for more than 80 years at a return of barely 5 percent. To complete the deal, the pair must win over two main constituencies: shareholders and regulators. When the companies announced the acquisition, the usual raft of merger-chasing law firms announced investigations tacitly alleging that the offered combination of 1.128 Wisconsin Energy shares and $18.58 in cash shortchanged Integrys Energy’s shareholders. This offer represents a 17 percent to 23 percent premium to Integrys Energy’s pre-deal stock price. Almost a week later, this value has held steady–a strong vote of confidence that the market views the deal as a win-win for both sides. Whereas Wisconsin Energy’s shareholders will receive an immediate upward adjustment to their dividend, investors in Integrys Energy will be pleased by the promise of 7 percent to 8 percent dividend growth after several years of stagnation. In short, shareholder approval likely won’t present an impediment to the deal. The two utilities enjoy salutary relations with regulators in Minnesota, Michigan and Wisconsin, where the company will maintain its corporate headquarters. The Federal Energy Regulatory Commission (FERC) may examine the consolidation of ownership in the American Transmission Co., as the acquisition will increase Wisconsin Energy’s ownership stake to 60.3 percent from 24.2 percent. In particular, the regulator’s deliberations almost certainly will reflect its shifting policies for allowed rates of return on investment. American Transmission Co. enjoys a return on equity of 12.2 percent, which is outside the range of 10.57 percent to 11.74 percent that FERC has approved in recent cases. Klappa estimates that the combined company’s earnings per share could take a hit of $0.01 to $0.04, depending on how FERC rules on this matter. But this concession would help to get the deal done, and ongoing system investment should help to offset this headwind over time. We don’t foresee much opposition to the merger on antitrust grounds; regulated utilities that, by definition, operate as monopolies will account for 99 percent of Wisconsin Energy’s revenue after the deal closes. Illinois is the lone state where the deal could encounter major challenges. In fact, consumer advocates already announced their intention to investigate the combination’s effect on People Gas, Integrys Energy’s unit that provides regulated service to the Chicago area. Given Wisconsin Energy’s strong track record and enhanced financial power after the deal, Illinois officials likely will try to extract their pound of flesh rather than reject the merger outright. By law, Illinois has 12 months from June 23 to rule on the acquisition, which likely factors in to management’s expectation that the deal will close in summer 2015. What does the deal mean for shareholders? 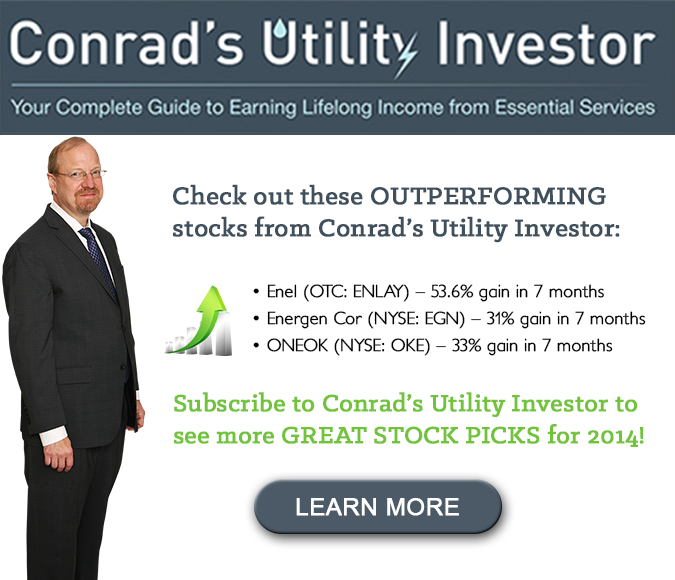 Wisconsin Energy and Integrys Energy have Hold ratings in my Utility Report Card, a regularly updated table that includes my comments, vital statistics and proprietary quality grades on more than 200 essential-services stocks. 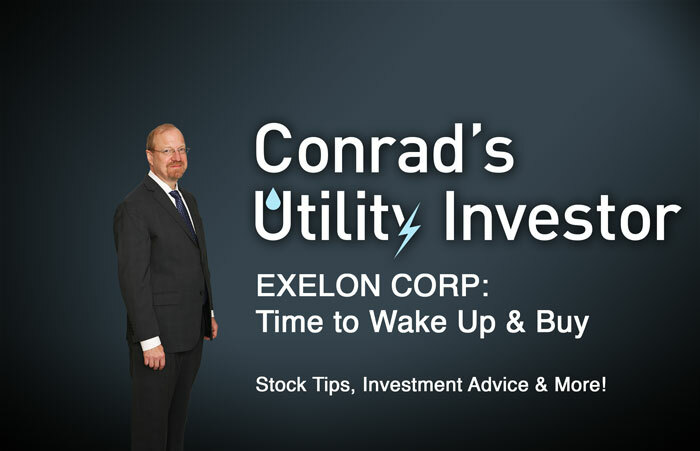 This treasure trove of knowledge is available exclusively to subscribers of Conrad’s Utility Investor and ensures that they always know where their investments stand. Not a subscriber? Sign up for a risk-free trial of the service to kick the tires; I’m confident that you’ll find its superior to any competitor. Wisconsin Energy’s stock yields a paltry 3.4 percent and trades at a demanding valuation–2.4 times book value–after rallying by more than 200 percent since March 2009. Although Intergys Energy’s shares traded at a more reasonable valuation, the utility hadn’t raised its dividend for some time and appeared to be at least a few years away from doing so. Although Integrys Energy and Wisconsin Energy will be worth a good deal more after the acquisition closes, a lot can happen in the intervening year. We’d wait for the deal to move closer to completion or a pullback–fears of rising interest rates could cause a temporary selloff in the utility sector–to establish or add to a position in either name.